All Saints Church – Buckland. St. John the Evangelist, The Willows. I first owned a Mini Mayfair in 1982, it was silver and BFG (British Forces Germany) registered. I sold my VW Scirocco to buy her and loved her from the very first day. But when I was posted to Berlin in 1984 the Mini struggled the long distances such as Berlin to Poole in England at times especially in heavy rain with the rain water getting into the distributor, I simply had to replace her to enable me to drive back to the United Kingdom as often as I used to. I exchanged her for a Ford Capri with my old friend Rae in 1987 or so and pretty much regretted it the same day. 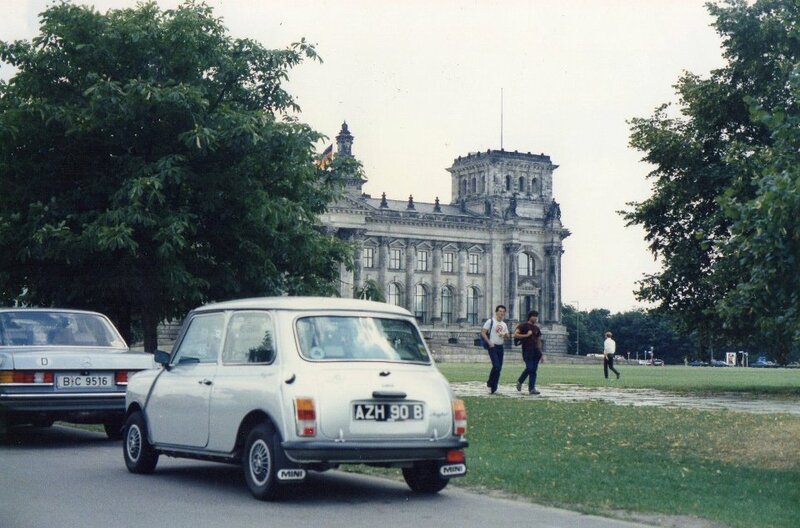 My first Mini Mayfair – this picture was taken about 1985 outside the Reichstag in Berlin whilst I was fortunate to be posted there. I went on the hunt for her last year (2012), but as I did not get her a UK registration number as I was always in BAOR (British Army of the Rhine) nor do I have her chassis number (my friends wife no longer hold any of the UK registration details) the search pretty much came to a halt as soon as it began so I decided to do the next best thing and buy another one of the same year and model. I purchased my current Mini in the middle of 2013 on my return from holiday in Florida, I found her listed on eBay after a lot of searching for the right one and after some negotiations from the States on eBay (thank god for WiFi) she was mine. I took her home with some big plans about 2 days after my return to the United Kingdom which included doing her up fully and restoring her to her former glory, that was supposed to be done over a period of many years maybe even years after all I knew it was going to cost a bit of money to achieve my goals. The Mini is a 1992 Mini Mayfair in postbox red, she had at the time of purchase done just over 50,000 miles and she looked to be in excellent condition. I was told that the panels were all new and the welding was freshly done with a sound running engine, well the latter part of the tale has to date been proved to be right, she does indeed drive like a dream with the occasional hiccup, but the rest has been found wanting as you will read later on the other pages. Unfortunately I had an accident in January 2014 and those plans were brought forward by a fair few years and although doing up a classic car is never ending as we just keep finding more rust or other damaged components, she is getting to where I want her to be. She under went a complete makeover after the accident with the aid of the insurance money, but more and more work had to be done as poor welding and the poor condition of some of the panels the seller had put on, again those details will be written on another page. This website has been created to enable me to share with you the horrors found and the repair process after being involved in an accident. Her being repaired, re-sprayed and is now being driven as if nothing ever happened. My plan is to drive all around this beautiful country (and Europe once found to be in a good running condition) of ours over the coming years, and photograph her at various known and unknown places in as many counties as we possibly can within the United Kingdom. So here goes, I hope you enjoy the travels.